Travelling together is wonderful, yet challenging. We are learning so much about ourselves and each other as every day brings with it the unexpected, constant decisions having to be made and challenges to solve. It’s what we signed up for and we’re loving it…mostly. We travelled along the 101 South, the coastal route from Oregon to California, a route famous for its beauty. After the challenges with the weather in Canada we felt elated and that “at last our trip has started!” The weather was warming up as we travelled south and the scenery was simply magnificent…switchback roads snaking through rugged coast line, along the edge of cliff tops then down again to beaches. We we’re constantly amazed at the magnificent scenery and riding a motorcycle grants a unique experience of it all…you’re exposed to everything, the smells (beautiful and bad! ), every subtle change in temperature, sounds and heightened emotion… One day we were treated to sea mist covering town in the morning, so riding up along the sea cliffs was like riding up into the clouds, then through them, to look down on a world of white. Once back at beach level, the mist lay like wisps of candy floss on the wet sand…it was all simply spectacular! One special moment will forever stay with me. I was looking back at the ‘candy floss’ sea mist on the wet beach sand. We had been quietly lost in our own worlds of awe at the beauty around us, so when Paul spoke through the Sena intercoms in our helmets, he was breaking a spell of quiet meditation. He did not acknowledge the beauty around us, but started telling me how much he appreciates me, what he loves about me and then finally said: “You’ve made this trip something special for me…” and that’s what made me cry – I was overwhelmed with the beauty around me and the gift of experiencing this all with Paul. The Avenue of Giants and redwood forests were something special too…the massive trees with an almost pre-historic beauty, making me think that just maybe dinosaurs actually did exist?! We have absolutely loved the US and its people! Everywhere we’ve been we’ve been warmly welcomed and treated to so many stories, people openly sharing their dreams. 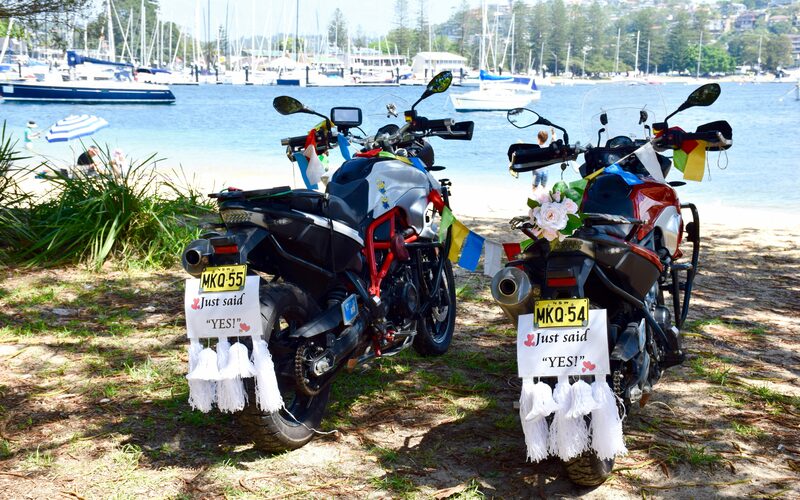 We suspect that riding motorcycles with Australian registrations has drawn others to us, but something amazing we’ve noticed is that because people see us living our dream, they’ve spontaneously opened up to us about theirs! In Seaside, Oregon we met Bear, a tattoo artist who shared his history as a Native American. A beautiful soul, we were fascinated as much with his story and dreams as an artist as we were with the star tattoos on his face and star implants on his forehead. In Astoria Barney helped us re-fuel and shared his dream of visiting Australia to catch a big fish. We had just crossed the mighty Colombia river mouth via a 5km long bridge and were in awe of this engineering feat. (The Colombia is the largest river in the Pacific North West, originating in the Rockys in Canada.) Barney posed for a photo and insisted on giving us a souvenir which he bought from the shop. In California we met Patrick who offered us accommodation and beers and hopes to ride with us when we get to Vegas. Janet is a kindred soul and an inspiration. She’ll be 70 soon and was riding her BMW with her husband Bill, when we met them in Yosemite National Park…We have been offered help in so many ways…accommodation, advice and what we’ve marvelled at most is how people have gone out of their way to voluntarily assist. It’s not unusual for someone in a store to phone around to get an answer to a question we’ve asked or to look up information on the internet. The enthusiasm and generosity of spirit of the Americans has simply blown us away. Yesterday a biker walked up to me saying: “Howdy, where ya’ll from?” He then went on to ask: “So how have we been treating you so far?” When I replied that America has been amazing he smiled and said: “That’s just wonderful to hear! Glad you feel welcome. Our president is a bit ‘out of the box’, but we’re all really great!” It has not been unusual for Americans to apologise like that in conversation or admit to being embarrassed, which has reminded me so much about how bad I felt as a South African under Apartheid rule.